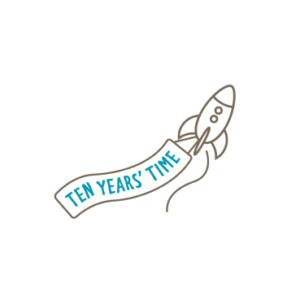 Ten Years’ Time was launched to connect a new generation of philanthropists to the communities they wish to serve. We are ambitious about the opportunity philanthropy presents to create profound social change and believe that if our clients truly understand the problems they wish to overcome, they will be able to fulfil that ambition. We know that short-term, late intervention programmes do not address systemic challenges. To make a lasting change we need to go upstream, find new ways of working and challenge systems to act differently. In its independence, longevity and flexibility, philanthropy has an opportunity to do this. We offer no charity fundraisers, no rubber chicken dinners, no waiting around for others to co-invest. Instead we help philanthropists find ‘big ideas’ that could create a lasting system transformation rather that a short-term ‘fix’. Our success on any given project is simple – will the money our clients spend over the next few years leave a lasting positive effect in ten years’ time? Most philanthropy does not. We work with leaders who are willing to be more than chequebooks, who are ready to understand, learn, take risks and be part of the solution. Our founding CEO, Jake Hayman, was voted one of London’s 2014 ‘Most influential’ for his work in this field and has become a vocal advocate for the change that philanthropy can create when done well. The firm has experience working in the UK, US, Middle East, Central Asia and East and West Africa. We cover most cause areas though our sweet spot is human potential – education, entrepreneurship, issue of poverty, wellbeing and transitions to employment. I’ve now recommended (TYT) to two of Harbottle and Lewis’ top private clients. The clients have loved working with them to move from quite traditional philanthropy to something much more adventurous that gives them the opportunity to learn a lot more and, we hope, to make a much greater difference to the world. Working with (TYT) helped us gain real insight into some of the country’s most pressing problems. Their insight and support was crucial in guiding us towards investing time and money in some truly transformative ways. We were looking for a consultancy that would help us to donate our £2m wisely. (TYT)’s grounded insights, experience, enthusiasm, and professionalism resulted in us selecting five incredible projects that we’re very excited to be supporting.